Pashtuns (Pashto/Urdu/Persian: پشتون Paštūn or پختون Paxtūn, also rendered as Pushtuns, Pakhtuns, Pukhtuns), also called Pathans (Urdu: پٹھان, Hindi: पठान Paṭhān) or ethnic Afghans (Pashto: افغان Afğān) represent an Eastern Iranian ethno-linguistic group with populations primarily in eastern and southern Afghanistan and in the North-West Frontier Province, Federally Administered Tribal Areas and Balochistan provinces of western Pakistan. Their Pashto language and the practice of Pashtunwali, a pre-Islamic code of conduct, culture and honor typically characterize the Pashtuns. Pashtuns have rarely been politically united. Their unified modern past began with the rise of the Durrani Empire in 1747. The Pashtuns in Afghanistan played a pivotal role during the Great Game as they found themselves caught between the imperialist designs of the British and Russian empires. During most of modern Afghanistan's history, Pashtuns reigned as the dominant ethnic group, while being amongst the most intransigent tribes that fought British Indian incursions. The Pashtuns gained world-wide attention following the Soviet invasion of Afghanistan in 1979 and with the rise and fall of the Taliban, since they constituted the main ethnic contingent in the movement. Pashtuns represent an important community in Pakistan, where they have a dominant representation in the military and comprise the second-largest ethnic group. The Pashtuns embody the world's largest (patriarchal) segmentary lineage ethnic group. The total population of the group has been estimated at approximately forty million, but an accurate count remains elusive due to the nomadic nature of many tribes, the practice of secluding women, and the lack of an official census in Afghanistan since 1979. The vast majority of Pashtuns live in an area stretching from western Pakistan to southwestern Afghanistan. Additional Pashtun communities reside in the Northern Areas, Azad Kashmir, and Sindh provinces of Pakistan as well as throughout Afghanistan and in the Iranian region of Khorasan. A large migrant-worker community lives in the countries of the Arabian Peninsula and in smaller communities in Europe and North America. A sizable community of largely putative ancestry calls India home. Important metropolitan centers of Pashtun culture include Peshawar and Kandahar. In addition, Quetta and Kabul have ethnically mixed cities with large Pashtun populations. With 1.5 million ethnic Pashtuns, Karachi stands the largest Pashtun city in the world. Pashtuns comprise over 15.42 percent of Pakistan's population or 25.6 million people. In Afghanistan, they make up an estimated 42 percent of the population or 12.5 million people. The exact measure of those figures remains uncertain, particularly for Afghanistan, which has been affected by approximately three million Afghan refugees (of which 81.5 percent or 2.49 million claim ethnic Pashtuns lineage) that remain in Pakistan. An unknown number of refugees continue to reside in Iran. A cumulative population assessment by the United Nations suggests a total of over forty million across the region. The Pashtuns have an ancient history, much still unresearched. From the second millennium B.C.E. to the present, Pashtun regions have seen invasions and migrations including Aryan tribes (Iranian peoples, Indo-Aryans), Medes, Persians, Mauryas, Scythians, Kushans, Hephthalites, Greeks, Arabs, Turks, and Mongols. Many conflicting theories exist about the origins of the Pashtun people, some modern and others archaic, both among historians and the Pashtuns themselves. The Greek historian Herodotus first mentioned a people called Pactyans, living on the eastern frontier of the Persian Satrapy Arachosia as early as the 1st millennium B.C.E.. In addition, the Rig-Veda mentions a tribe called the Pakthas (in the region of Pakhat) inhabiting eastern Afghanistan, and some have speculated that they may have been early ancestors of the Pashtuns. Other ancient peoples linked to the Pashtuns includes the Bactrians who spoke a related Middle Iranian language. Pashtuns, historically referred to as ethnic Afghans, the terms Pashtun and Afghan having been synonymous until the advent of modern Afghanistan and the division of the Pashtuns by the Durand Line, a border drawn by the British in the late nineteenth century. According to V. Minorsky, W.K. Frazier Tyler, M.C. Gillet and several other scholars, "The word Afghan first appears in history in the Hudud-al-Alam in 982 C.E." The Pashtuns used the term, referring to a common legendary ancestor known as Afghana. Some historians believe that the Pashtuns emerged from the area around Kandahar and the Sulaiman Mountains, and began expanding millennia ago. In that geographic location they would have often been in close contact with the ancient Persians and Maurya Empire, and may have been Zoroastrians, Buddhists, Hindus, Jews or probably others prior to the arrival of Muslim Arabs in the seventh century. The Pashtuns have a mixed origin, their language classified as an Eastern Iranian tongue, itself a sub-branch of the Indo-Iranian branch of the greater Indo-European family of languages, and thus the Pashtuns have been classified as an Iranian people, possibly as partial modern-day descendants of the Scythians, an ancient Iranian group. According to academic Yu. V. Gankovsky, the Pashtuns began as a "union of largely East-Iranian tribes which became the initial ethnic stratum of the Pashtun ethnogenesis, dates from the middle of the first millennium C.E. and is connected with the dissolution of the Epthalite (White Huns) confederacy." Early precursors to the Pashtuns had been Old Iranian tribes that spread throughout the eastern Iranian Plateau. The Pashto-speaking Pashtuns refer to themselves as Pashtuns or Pukhtuns depending upon whether they speaker the southern dialect or northern dialect respectively. Those Pashtuns compose the core of ethnic Pashtuns found in western Pakistan and southern-eastern Afghanistan. Many Pashtuns have intermingled with the varied invaders, neighboring groups, and migrants (as have the other Iranian peoples). In terms of phenotype, the Pashtuns overall constitute a predominantly Mediterranean people, with light hair and eye colors common, especially among remote mountain tribes. 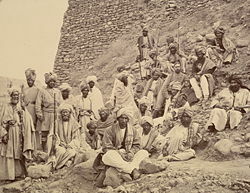 Pashtun chiefs and a British Political Officer posed at Jamrud fort at the mouth of the Khyber Pass in 1878. Some anthropologists lend credence to the mythical oral traditions of the Pashtun tribes themselves. For example, according to the Encyclopaedia of Islam, the theory of Pashtun descent from Israelites traces to Maghzan-e-Afghani who compiled a history for Khan-e-Jehan Lodhi in the reign of Mughal Emperor Jehangir in the seventeenth century C.E. Another book that corresponds with Pashtun historical records, Taaqati-Nasiri, states that in the seventh century a people called the Bani Israel settled in Ghor, southeast of Herat, Afghanistan, and then migrated south and east. Those Bani Israel references stand in line with the commonly held view by Pashtuns that when the twelve tribes of Israel dispersed, the tribe of Joseph, among other Hebrew tribes, settled in the region. Hence the tribal name 'Yusef Zai' in Pashto translates to the 'sons of Joseph'. Iranian historian Ferishta told a similar story. Maghzan-e-Afghani's Bani-Israel theory has been questioned due to its major historical and linguistic inconsistencies, especially the main one that Assyria exiled the Ten Lost Tribes, yet Maghzan-e-Afghani refers to the ruler of Persia permitting them to go east to Afghanistan. That inconsistency can be explained by Persia acquired the lands of the Assyrian Empire when it conquered Babylonia, which had conquered Assyria decades earlier. Yet no ancient author mentioned such a transfer of Israelites further east, nor do ancient extra-Biblical texts exist that refer to the Ten Lost Tribes at all. Yet, that oral tradition has widespread credence among the Pashtuns. Legends abound over the centuries telling of the descend from the Ten Lost Tribes after groups converted to Christianity and Islam. The Rig Veda believed to have been composed before 1200 B.C.E., mentions the Pashtuns as living in the area of Afghanistan.No ancient author before the conversion of the Pashtuns to Islam mentions any Israelite or Jewish connection. The oral tradition may be a myth which grew out of a political and cultural struggle between Pashtuns and the Mughals, explaining the historical backdrop for the creation of the myth, the inconsistencies of the mythology, and the linguistic research that refutes any Semitic origins. Other Pashtun tribes claim descent from Arabs, including some even claiming to be descendants of the Muslim Prophet Muhammad (popularly referred to as sayyids). Some groups from Peshawar and Kandahar (such as the Afridis , Khattaks and Sadozais) also claim to be descended from Alexander the Great's Greeks. Research into human DNA has emerged as a new and innovative tool used to explore the genetic make-up of populations to ascertain historical population movements. According to some genetic research the Pashto-speaking Pashtuns relate mainly to other Iranian peoples as well as the Burusho of the Northern Areas of Pakistan, who speak a language isolate. 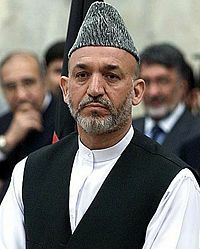 President Hamid Karzai in 2004. The Pashtuns intimately tied into the history of modern Afghanistan and western Pakistan, sometimes referred to as Pashtunistan. Following Muslim Arab and Turkic conquests from the seventh to eleventh centuries, Pashtun ghazis (warriors for the faith) invaded and conquered much of northern India during the Khilji dynasty (1290-1321), Lodhi dynasty (1451-1526) and Suri dynasty (1540-1556). The Pashtuns' modern past stretches back to the Hotaki dynasty (1709-1738) and later the Durrani Empire (1747-1823). The Hotakis had been Ghilzai tribesmen, who defeated the Persian Safavids and seized control over much of Persia from 1722 to 1738. The conquests of Ahmad Shah Durrani, a former high-ranking military commander under the ruler Nadir Shah of Persia, followed. He founded the Durrani Empire which covered most of today's Afghanistan, Pakistan, Kashmir, Indian Punjab, and Khorasan province of Iran. After the fall of the Durrani Empire in 1818, the Barakzai clan took control of Afghanistan. Specifically, the subclan known as the Mohamedzai ruled Afghanistan between 1826 to the end of Mohammad Zahir Shah reign in 1973. That legacy continues into modern times as President Hamid Karzai, an ethnic Pashtun from Kandahar, runs Afghanistan. The Pashtuns in Afghanistan resisted British designs upon their territory and kept the Russians at bay during the so-called Great Game. Afghanistan remained an independent nation that played the two large imperialist empires against each other to maintain some semblance of autonomy (see the Siege of Malakand). Despite that initial success at maintaining territorial unity, during the reign of Abdur Rahman Khan (1880-1901), the Durand Line divided Pashtun regions, and the British India took control of today's western Pakistan in 1893. In the twentieth century, some Pashtun leaders living under British Indian rule in the North-West Frontier Province supported Indian independence, including Khan Wali Khan and Khan Abdul Ghaffar Khan (both members of the Khudai Khidmatgar, popularly referred to as the Surkh posh or "the Red shirts"), who had been inspired by Mahatma Gandhi's non-violent method of resistance. Later, in the 1970s, Khan Wali Khan pressed for more autonomy for Pashtuns in Pakistan. Pashtuns in Afghanistan attained complete independence from British intervention during the reign of King Amanullah Khan, following the Third Anglo-Afghan War. The monarchy ended with Sardar Daoud Khan seizing control of Afghanistan in 1973, which opened the door to Soviet intervention and eventually culminated in the Saur Revolution or Communist take-over of Afghanistan in 1978. Starting in the late 1970s, many Pashtuns joined the Mujahideen opposition against the Soviet invasion of Afghanistan. Those Mujahideen fought for control of Afghanistan against the Communist Khalq and the Parcham factions. More recently, the Pashtuns became known for being the primary ethnic group that comprised the Taliban, a religious movement that emerged from Kandahar, Afghanistan. In late 2001, the US-led invasion of Afghanistan removed the Taliban government from power. Pashtuns have played an important role in the regions of South and Central Asia and the Middle East. In neighboring Pakistan, ethnic Pashtun politicians, notably Ayub Khan and Ghulam Ishaq Khan, have also attained the Presidency, as well as high government posts such as Army Chief (Gul Hasan Khan) and Ministries. The Afghan royal family, now represented by Muhammad Zahir Shah, has ethnic Pashtun origin. 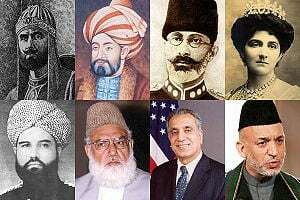 Other prominent Pashtuns include the seventeenth-century warrior poet Khushal Khan Khattak, Afghan "Iron" Emir Abdur Rahman Khan, and in modern times U.S. Ambassador to the United Nations (Zalmay Khalilzad) and former Afghan Cosmonaut (Abdul Ahad Mohmand) among many others. Pashtuns predominantly constitute an Eastern Iranian people, speakers of the Pashto language and who live in a contiguous geographic location across Pakistan and Afghanistan. That represents the generally accepted academic view. Pashtuns, Muslims, follow Pashtunwali, as well as being Pashto-speakers and meeting other criteria. In accordance with the legend of Qais Abdur Rashid, (c. 575 - 661 C.E.) the figure traditionally regarded as progenitor of the Pashtun people, Pashtuns relate patrilineality to legendary times. Those three definitions constitute the ethno-linguistic definition, the religious-cultural definition, and the patrilineal definition, respectively. 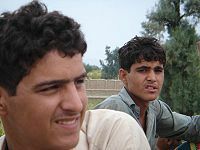 Young Pashtun men in Nangarhar province, in eastern Afghanistan. The ethno-linguistic definition has emerged as the most prominent and widely accepted view about what defines a Pashtun. Generally, that most common view holds that Pashtuns fall within the parameters of having mainly eastern Iranian ethnic origins, sharing a common language, culture and history, living in relatively close geographic proximity to each other, and acknowledging each other as kinsmen. Thus, tribes that speak disparate yet mutually intelligible dialects of Pashto will acknowledge each other as ethnic Pashtuns and even subscribe to certain dialects as "proper," such as the Pukhtu spoken by the Yousafzai and the Pashto spoken by the Durrani in Kandahar. Most Pashtuns in Pakistan and Afghanistan tend to use those criteria as the basis for who counts as a Pashtun. The religious and cultural definition has more stringent criteria, requiring Pashtuns to be Muslim and adherents of the Pashtunwali code. That view prevails among the more orthodox and conservative tribesmen who reject the view that Pashtuns derive from the Jewish faith as actual Pashtuns, even if they themselves might claim Hebrew ancestry, depending upon the tribe in question. The laws of Pashtunwali partially base upon the religious definition for Pashtuns, and that Pashtun must follow and honor Pashtunwali. Pashtun society lacks complete homogenous in the religious sense, as Pashtuns, predominantly Sunni Muslims, can also be followers of the Shia sect among others. In addition, the Pakistani Jews and the Afghan Jewish population, once numbering in the thousands, have largely relocated to Israel. Overall, more flexibility can be found among Pashtun intellectuals and academics who sometimes simply define a Pashtun based upon other criteria that often excludes religion. The patrilineal definition bases on an important orthodox law of Pashtunwali, especially the requirement that anyone claiming to be a Pashtun must have a Pashtun father. That law has maintained the tradition of exclusively patriarchal tribal lineage intact. Under that definition, an ethnic Pashtuns have less regard to the language one speaks (Pashto, Persian, Urdu, English, etc.) and more for one's father. Thus the Pathans in India, for example, who have lost both the language and presumably many of the ways of their putative ancestors, can, by being able to trace their fathers' ethnic heritage back to the Pashtun tribes (who some believe descended from the four grandsons of Qais Abdur Rashid, a possible legendary progenitor of the Pashtuns), remain "Pashtun". The legend states that Qais, after having heard of the new religion of Islam, traveled to meet the Muslim Prophet Muhammad in Medina and returned to Afghanistan-Pakistan area as a Muslim. Qais is said to have married the daughter of the Sword of Allah, otherwise known as Khalid bin Walid, and they purportedly had many children and one son, Afghana, produced up to four sons who set out towards the east including one son who went towards Swat, another towards Lahore, another to Multan, and finally one to Quetta. That legend numbers among many traditional Pashtun tales regarding their disparate origins that remain largely unverifiable. A variety of communities claiming Pashtun descent live for the most part among other groups in South and Central Asia who generally speak a language other than Pashto and either overlap with other groups or simply categorize with the ethno-linguistic group that correspond to their geographic location and their mother tongue. Some groups claiming Pashtun descent include various non-Pashtun Afghans often conversant in Persian rather than Pashto. Many claimants of Pashtun heritage in South Asia have mixed with local Muslim populations and refer to themselves (and Pashto-speaking Pashtuns and often Afghans in general) in the Hindi-Urdu variant Pathan rather than Pashtun or Pukhtun. Those populations usually comprise only part-Pashtun, to varying degrees, often tracing their Pashtun ancestry putatively through a paternal lineage, many regarding them as non-ethnic Pashtuns (see section on Pashtuns Defined for further analysis). Some groups claiming Pashtun descent live in close proximity to Pashtuns such as the Hindkowans who sometimes go by the name Punjabi Pathans (in publications such as Encyclopædia Britannica). The Hindkowans speak the Hindko language, usually regarded as a group of mixed Pashtun and Punjabi origin. 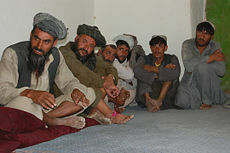 Culturally similar to Pashtuns, the Hinkowans often practice Pashtunwali in Pashtun-majority areas. The Hindkowans constitute a large minority in major cities such as Peshawar, Kohat, Mardan, and Dera Ismail Khan and in mixed districts including Haripur and Abbottabad where they often speak both Hindko and Pashto. Additionally, upwards of 20 percent of Urdu-speakers claim partial Pashtun ancestry. Indian Pathans claim descent from Pashtun soldiers that settled in northern India and intermarried with local Muslim women during the era of the Delhi Sultanate (especially under the Lodhi dynasty) and Mughal Empire. The Rohilla Pashtuns, after the British defeat them, gained notoriety for intermarrying with local Muslims. Many believed them to have been bilingual in Pashto and Urdu until the mid-nineteenth century. The repression of Rohilla Pashtuns by the British in the late eighteenth century caused thousands to flee to the Dutch colony of Guyana in South America. Today, the Afghan proper refer to themselves as Ban-i-Afghan or Ban-i-Isrial to differentiate themselves from the Indian Pathan. With that differentiation in mind, the population of Pathans in India numbers around 11,324,000; that population distributes throughout the states of India. Lastly, small minorities of Sikhs and Hindus, often bilingual in Pashto and Punjabi, estimated to number in the thousands, live in parts of Afghanistan. Pashtun culture has been formed over the course of many centuries. Pre-Islamic traditions, probably dating back to as far as Alexander's conquest in 330 B.C.E., survived in the form of traditional dances, while literary styles and music largely reflect strong influence from the Persian tradition and regional musical instruments fused with localized variants and interpretation. Pashtun culture constitutes a unique blend of native customs and strong influences from Central, South and West Asia. The Pashtuns speak Pashto, an Indo-European language, belonging to the Iranian sub-group of the Indo-Iranian branch, within Eastern Iranian and Southeastern Iranian. Pashto writing uses the Perso-Arabic script, dividing into two main dialects, the northern "Pukhtu" and the southern "Pashto." Pashto has ancient origins and bears similarities to extinct languages such as Avestan and Bactrian. Its closest modern relatives include Pamir languages, such as Shughni and Wakhi, and Ossetic, and has an ancient legacy of borrowing vocabulary from neighboring languages including Persian and Vedic Sanskrit. Invaders have left vestiges as well as Pashto has borrowed words from Ancient Greek, Arabic and Turkic, while modern borrowings come primarily from English. Fluency in Pashto often serves as the main determinant of whether a group belongs to the Pashtun ethnic group. Pashtun nationalism emerged following the rise of Pashto poetry that linked language and ethnic identity starting with the work of Khushal Khan Khattak (1613 - 1689) and continued with his grandson Afzal Khan (author of Tarikh-e Morassa, (a history of the Pashtun people). Pashto has national status in Afghanistan and regional status in Pakistan. In addition to their mother-tongue, many Pashtuns speak Dari (Afghan Persian) and/or Urdu as well as English fluently. Pashtuns, predominantly Sunni Muslims who follow the Hanafite branch of Sunni Islam. A small minority of Ithna Asharia Shia Pashtuns largely concentrate in Afghanistan. Studies conducted among the Ghilzai reveal strong linkages between tribal affiliation and membership in the larger ummah (Islamic community), as most Pashtuns believe themselves descendants of Qais Abdur Rashid who purportedly had been a early convert to Islam, thus bequeathing the faith to the entire Pashtun population. A legacy of Sufi activity remains common in Pashtun regions as evident in song and dance. Many Pashtuns have gained prominence as Ulema (Islamic scholars), such as Dr. Muhammad Muhsin Khan who translated the Noble Quran and Sahih Al-Bukhari and many other books into English. Lastly, virtually all Pashtuns declare Muslim faith; limited data exists regarding irreligious groups and minorities. Throughout Pashtun history, poets, prophets, kings and warriors have been amongst the most revered members of society. For much of Pashtun history, literature has played a minor role as Persian served the literary lingua franca used for communication purposes by neighboring peoples and generally relied upon for writing purposes. By the sixteenth century early written records of Pashto began to appear, the earliest of which describes Sheikh Mali's conquest of Swat. The advent of Pashto poetry and the revered works of Khushal Khan Khattak and Rahman Baba in the seventeenth century helped transition Pashto towards the modern period. In the twentieth century, Pashto literature gained significant prominence with the poetic works of Ameer Hamza Shinwari, noted for his development of Pashto Ghazals. In recent times, Pashto literature has received increased patronage, but due to relatively high illiteracy rates, many Pashtuns continue to rely upon the oral tradition. Pashtun males continue to meet at chai khaanas or tea cafés to listen and relate various oral tales of valor and history. Despite the general male dominance of Pashto oral story-telling, Pashtun society has some matriarchal tendencies. Folktales involving reverence for Pashtun mothers and matriarchs abound, passed down from parent to child, as with most Pashtun heritage, through a rich oral tradition that has survived the ravages of time. The term "Pakhto" or "Pashto," from which the Pashtuns derive their name, denotes a pre-Islamic honor code/religion formally known as Pashtunwali (or Pakhtunwali) as well as the name of their language. Religious anthropologists believe Pashtunwali originated millennia ago during pagan times and has, in many ways, fused with Islamic tradition. Pashtunwali governs and regulates nearly all aspects of Pashtun life ranging from tribal affairs to individual "honor" (nang) and behavior. Numerous intricate tenets of Pashtunwali influence Pashtun social behavior. Melmastia, or the notion of hospitality and asylum to all guests seeking help, represents one of the better known tenets. Perceived wrongs or injustice call for Badal or swift revenge. The British borrowed and popularized in the West a popular Pashtun saying, "Revenge is a dish best served cold." The code demands that men protect Zan, Zar, Zameen, which translates to women, treasure, and land. Some aspects promote peaceful co-existence such as Nanawati or the humble admission of guilt for a wrong committed, which should result in automatic forgiveness from the wronged party. Many Pashtuns continue to follow those and other basic precepts of Pashtunwali, especially in rural areas. Traditional sports include naiza bazi, which involves horsemen who compete in spear throwing. Polo, an ancient traditional sport in the region, has been popular among many tribesmen such as the Yousafzai. Like other Afghans, many Pashtuns engage in wrestling (Pehlwani), often as part of larger sporting events. Cricket, largely a legacy of British rule in the North-West Frontier Province, has become popular, many Pashtuns having become prominent participants (such as Shahid Afridi and Imran Khan). Football appeared more recently, the sport attracting that increasing numbers of Pashtuns. Children engage in various games including a form of marbles called buzul-bazi, played with the knuckle bones of sheep. Although traditionally less involved in sports than boys, young Pashtun girls often play volleyball and basketball, especially in urban areas. Pashtun performers remain avid participants in dance, sword fighting, and other physical feats, Pashtun dances standing out as the most common form of artistic expression. The Attan, a dance with ancient pagan roots later modified by Islamic mysticism in some regions, has become the national dance of Afghanistan. A rigorous exercise, dancers perform Attan as musicians play native instruments including the dhol (drums), tablas (percussions), rubab (a bowed string instrument), and toola (wooden flute). Involving a rapid circular motion, dancers perform until all stop dancing in a fashion similar to Sufi whirling dervishes. Numerous other dances, affiliated with several tribes, include the Khattak Wal Atanrh (named after the Khattak tribe), Mahsood Wal Atanrh (which, in modern times, involves the juggling of loaded rifles), and Waziro Atanrh among others. A sub-type of the Khattak Wal Atanrh known as the Braghoni involves the use of up to three swords and requires great skill to successfully execute. Though males dominate most dances, some dance performances such as the Spin Takray feature female dancers. Additionally, young women and girls often entertain at weddings with the Tumbal (tambourine). Traditional Pashtun music has ties to Klasik (traditional Afghan music heavily inspired by Indian classical music), Iranian musical traditions, and other various forms found in South Asia. Popular forms include the ghazal (sung poetry) and Sufi qawwali music. General themes tend to revolve around love and religious introspection. Modern Pashto music currently centers around the city of Peshawar due to the various wars in Afghanistan, and tends to combine indigenous techniques and instruments with Iranian-inspired Persian music and Indian Filmi music prominent in Bollywood. Other modern Pashtun media include an established Pashto-language film and television industry based in Pakistan. Producers based in Lahore have created Pashto-language films since the 1970s. Pashto films, once popular, have declined both commercially and critically in recent years. Past films such as Yusuf Khan Sherbano dealt with serious subject matter, traditional stories, and legends, but the Pashto film industry has, since the 1980s, been accused of churning out increasingly lewd exploitation-style films. Pashtun lifestyle and issues have been raised by Western and Pashtun expatriate film-makers in recent years. Notable films about the Pashtun experience include British film-maker Michael Winterbottom's In This World which chronicles the struggles of two Afghan youths who leave their refugee camps in Pakistan and attempt to move to the United Kingdom in search of a better life, and the British mini-series Traffik (re-made as the American film Traffic) which featured a Pashtun man (played by Jamal Shah) struggling to survive in a world with few opportunities outside the drug trade. In addition, numerous actors of Pashtun descent also work in India's Bollywood film industry including Kader Khan and Feroz Khan. Elders hold esteemed positions in the Pashtun society, often making decisions for the community. The intricate system of tribes has been a prominent institution of the Pashtun people. The Pashtuns remain a predominantly tribal people, but the world-wide trend of urbanization has begun to alter Pashtun society as cities such as Peshawar and Quetta have grown rapidly due to the influx of rural Pashtuns and Afghan refugees. Many still identify themselves with various clans despite the trend towards urbanization. More precisely, several levels of organization exist within the Pashtun tribal system: the Tabar (tribe), which subdivides into kinship groups called Khels. The Khel, in turn, divides into smaller groups (Pllarina or Plarganey), each of which consists of several extended families or Kahols. "A large tribe often has dozens of sub-tribes whose members may see themselves as belonging to each, some, or all of the sub-tribes in different social situations (co-operative, competitive, confrontational) and identify with each accordingly." Pashtun tribes divide into four 'greater' tribal groups: Sarbans, Batans, Ghurghusht and Karlans. In addition to the tribal hierarchy, the Jirga or 'Senate' of elected elders and wise men represents another prominent Pashtun institution. Members of the Jirga, the main institution of authority that the largely egalitarian Pashtuns willingly acknowledge as a viable governing body, make most decisions in tribal life. Pashtuns often observe special occasions to celebrate and/or commemorate events, quite often national holidays in Pakistan and Afghanistan, and the common Turko-Iranian celebration known as Nouruz (or New Year). Muslim holidays including Ramadan and Eid al-Fitr stand as the most prominent. Muslim holidays, the most widely observed, often bring a halt to commercial activity as large extended families gather together as a religious duty and a festive celebration. The lives of Pashtun women vary from those who reside in conservative rural areas, such as the tribal belt, to those found in relatively freer urban centers. Though many Pashtun women remain tribal and illiterate, others have become educated and gainfully employed. The ravages of the Soviet occupation of Afghanistan and the Afghan wars, leading to the rise and fall of the Taliban, caused considerable hardship amongst Pashtun women as many of their rights had been curtailed, in favor of a rigid interpretation of Islamic law. The difficult lives of Afghan female refugees gained considerable notoriety with the iconic image of the so-called "Afghan Girl" (Sharbat Gula) depicted on the June 1985 cover of National Geographic magazine. In addition, the male-dominated code of Pashtunwali often constrains women and forces them into designated traditional roles that separate the genders. The pace of change and reform for women has been slow as a result of the wars in Afghanistan and the isolation and instability of tribal life in Pakistan. Modern social reform for Pashtun women began in the 20th century. During the early 20th century, Queen Soraya Tarzi of Afghanistan had been an early feminist leader whose advocacy of social reforms for women proved so radical that it led to the fall of her and her husband King Amanullah's dynasty. Even during the tumultuous Soviet occupation of Afghanistan, civil rights remained an important issue as feminist leader Meena Keshwar Kamal campaigned for women's rights and founded the Revolutionary Women of Afghanistan (RAWA) in the 1980s. Today, Pashtun women vary from the traditional housewives who live in seclusion to urban workers, some of whom seek or have attained parity with men. Due to numerous social hurdles, the literacy rate for Pashtun women remains considerably lower than that of males. Abuse of women has been widespread, yet women's rights organizations, which find themselves struggling with conservative religious groups as well as government officials in both Pakistan and Afghanistan, have been actively challenging the practices. According to researcher Benedicte Grima's book Performance of Emotion Among Paxtun Women, "a powerful ethic of forbearance severely limits traditional Pashtun women's ability to mitigate the suffering they acknowledge in their lives." Pashtun women often have their legal rights curtailed in favor of their husbands or male relatives as well. For example, although women technically have the right to vote in Afghanistan and Pakistan, many have been kept away from ballot boxes by males. Traditionally, Pashtun women have few inheritance rights and often involuntarily take care of large extended families of their spouses. Swara, another tradition that persists, involves the practice of giving a female relative to someone to rectify a dispute. The practice had been declared illegal in Pakistan in 2000, but continues in tribal regions. A young Pashtun woman in Afghanistan. Despite obstacles, many Pashtun women have begun a process of slow change. While most Pashtun women suffer from illiteracy, a rich oral tradition and resurgence of poetry has been inspirational to many Pashtun women seeking to learn to read and write. As a sign of further female emancipation, a Pashtun woman recently became one of the first female fighter pilots in the Pakistan Air Force. Further challenging the status quo, Vida Samadzai won the selection as Miss Afghanistan in 2003, a feat received with a mixture of support from those who back the individual rights of women and those who view such displays as anti-traditionalist and un-Islamic. In addition, numerous Pashtun women have attained high political office both in Pakistan and, following recent elections, in Afghanistan, where the percentage of female representatives stands as one of the highest in the world. Substantial work remains, though, for Pashtun women who hope to gain equal rights with men who remain disproportionately dominant in most aspects of Pashtun society. Human rights organizations, including the Afghan Women's Network, continue to struggle for greater women's rights, as does the Aurat Foundation in Pakistan, which attempts to safeguard women from domestic abuse. Note: population statistics for Pashtuns (including those without a notation) in foreign countries were derived from various census counts, the UN, the CIA World Factbook, Ethnologue, and the Joshua Project. ↑ Ali Banuazizi and Myron Weiner (eds.) 1994. The Politics of Social Transformation in Afghanistan, Iran, and Pakistan (Contemporary Issues in the Middle East) (Syracuse University Press. ISBN 0815626088) retrieved 7 June 2006. ↑ "Biography Khushal Khan Khattak"  Afghanistan-web.com. Retrieved June 20, 2008. ↑ Syed Saleem Shahzad, How the Taliban kept their coffers fullAsiaTimes Online. Jan. 10, 2007. Retrieved June 20, 2008. ↑ Iran-Pakistan: Refugees, IRIN Asia, UN Office for the Coordination of Humanitarian Affairs. retrieved 7 June 2006. ↑  Chapter 7 of The History of Herodotus, trans. George Rawlinson; originally written 440 B.C.E.) retrieved 10 January 2007. ↑ Rig Veda Book Seven, Political Gateway. retrieved 7 June 2006. ↑ The Khalaj West of the Oxus; excerpts from "The Turkish Dialect of the Khalaj," Bulletin of the School of Oriental Studies University of London, 10 (2): 417-437. retrieved 10 January 2007. ↑ Afghan's Share in Indian Art and Culture, Afghan Network. retrieved 3 May 2007. ↑ Swatis and Afridis, By T. H. Holdich, The Journal of the Anthropological Institute of Great Britain and Ireland 29 (1/2)(1899): 2-9. retrieved 04 May 2007. ↑ Pashtun, Encyclopædia Britannica. retrieved 10 January 2007. ↑ Nicholas Awde and Asmatullah Sarwan. Pashto Dictionary & Phrasebook: Pashto-English, English-Pashto. (Hippocrene Books, 2003, ISBN 078180972X) retrieved 10 January 2007. ↑ Iranian-speaking peoples. retrieved 10 January 2007. ↑ Yu. V. Gankovsky, et al. A History of Afghanistan. (Moscow: Progress Publishers, 1982), 382 retrieved 10 January 2007. ↑ Iranian plateau, Encyclopaedia Britannica. retrieved 10 February 2007. ↑ Old Iranian Online, University of Texas College of Liberal Arts. retrieved 10 February 2007. ↑ Afghanistan Ethnic Groups: Pashtun, US Library of Congress (retrieved 10 January 2007). ↑ Afghanistan: History. U.S. Department of State. retrieved 10 October 2006. ↑ Map of Durrani Empire, pbs.org. retrieved 10 October 2006). ↑ Map of the Durrani Empire, Afghanland. retrieved 10 October 2006. ↑ Durand Line, Encyclopaedia Britannica. retrieved 10 October 2006. ↑ Khan Abdul-Ghaffar Khan. Bachakhan.com. retrieved 10 October 2006. ↑ Afghanistan: At the Crossroads of Ancient Civilisations. BBC retrieved 10 October 2006. ↑ Pashtun Britannica On-Line. retrieved 18 January 2007. ↑ Understanding Pashto University of Pennsylvania Gazette. retrieved 18 January 2007. ↑ Pakistan: Pakhtuns U.S. Library of Congress. retrieved 18 January 2007. ↑ Pashto National Virtual Translation Center. retrieved 18 January 2007. ↑ The Pashtun Code, The New Yorker. retrieved 18 January 2007. ↑ Pathans in retrospect, Afghanan.net. retrieved 18 January 2007. ↑ Memons, Khojas, Cheliyas, Moplahs…. How Well Do You Know Them? Islamic Voice. retrieved 18 January 2007. ↑ Pakistan Ethnic Composition, Encyclopedia Britannica. retrieved 24 March 2007. ↑ Hindko in Kohat and Peshawar Bulletin of the School of Oriental and African Studies University of London, 43(3) (1980): 482-510. retrieved 18 January 2007. ↑ Study of the Pathan Communities in four States of India. Dawat Magazine. (retrieved 18 January 2007). ↑ Urdu speaking Pathans in India, Joshua Project. (retrieved 18 January 2007). ↑ Pashto Cinema-Craziness. Khyber.org. retrieved 18 January 2007. Ahmad, Aisha and Roger Boase. 2003. Pashtun Tales from the Pakistan-Afghan Frontier: From the Pakistan-Afghan Frontier. Saqi Books, 2003. ISBN 0863564380. Ahmed, Akbar S. 1976. Millennium and Charisma among Pathans: A Critical Essay in Social Anthropology. London: Routledge & Kegan Paul. ISBN 9780710083487. Banuazizi, Ali and Myron Weiner. eds. 1994. The Politics of Social Transformation in Afghanistan, Iran, and Pakistan. (Contemporary Issues in the Middle East). Syracuse University Press. ISBN 0815626088. Banuazizi, Ali and Myron Weiner. eds. 1988. The State, Religion, and Ethnic Politics: Afghanistan, Iran, and Pakistan. (Contemporary Issues in the Middle East). Syracuse University Press. ISBN 0815624484. Dupree, Louis. 1997. Afghanistan. Oxford University Press. ISBN 0195776348. Habibi, Abdul Hai. 2003. Afghanistan: An Abridged History. Fenestra Books. ISBN 1587361698. Halliday, Tony, ed. 1998. Insight Guide Pakistan. Duncan, South Carolina: Langenscheidt Publishing Group. ISBN 0887297366. Hasan, Ahmad. 1995. Peshawar: Historic city of the Frontier. Sang-e-Meel Publications. ISBN 9693505549. Hopkirk, Peter. 1984. The Great Game: The Struggle for Empire in Central Asia. Kodansha Globe; Reprint edition. ISBN 1568360223. Mansoor, A. Q. Ayub, et al., "A Study of the Greek Ancestry of Northern Pakistani Ethnic Groups Using 115 Microsatellite Markers." Am. J. Human Genetics 69 (1)(Oct 2001): 399. "The Pashtun People of Afghanistan"—from Road Junky Online travel guides. Frank Viviano, "Taliban may have origin in ancient tribe of Israel: Anthropologist finds many similarities". San Francisco Chronicle (October 2001).